USS Shaw (DD-373) wrecked in floating drydock YFD-2 on December 7, 1941, with fires were nearly out but structure still smoking. Her bow had been blown off by the explosion of her forward magazines, after she was set afire by Japanese dive bombing attacks. In the right distance are the damaged and listing USS California (BB-44) and a dredge. Raised out of the water in drydock, along with the old harbor tug Sotoyomo (YT-9), Shaw attracted the unwelcome attention of several dive bombers of the second strike wave. These hit her with three bombs at about the same time as they were attacking the then-nearby battleship USS Nevada (BB-36). These bombs all hit the forward portion of the ship. The resulting fires proved uncontrollable, and Shaw was ordered abandoned. 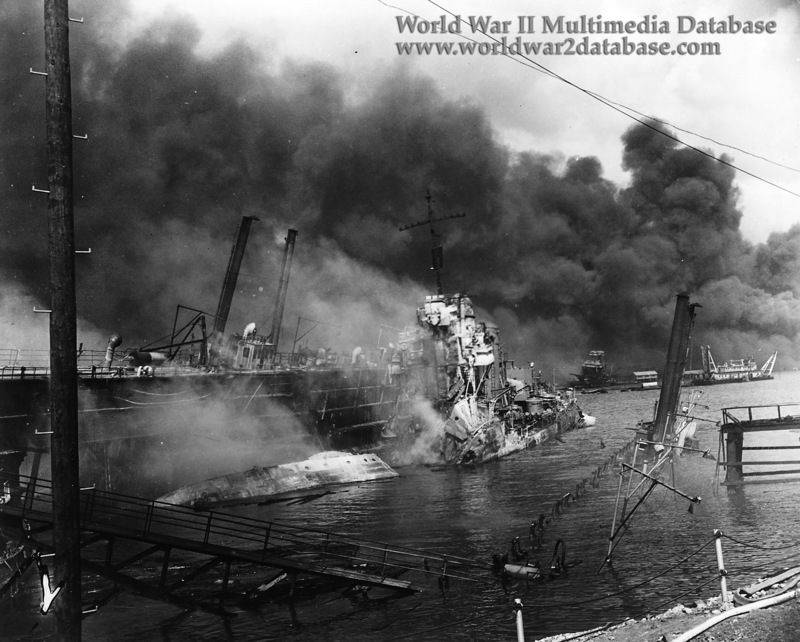 As efforts were underway to flood the drydock about a half-hour after she was hit, her forward ammunition magazines detonated in a spectacular blast, completely removing her bow. The blast also punctured YFD-2 and Sotoyomo. Both soon sank, the drydock partially and the tug completely, leaving Shaw's after portion afloat, with an intense fire raging at its front.